Joe Cuellar, Branch Manager for Castle & Cooke Mortgage in McAllen, Texas, truly knows the ins-and-outs of the mortgage business! Whether clients are seeking alternative ways of generating income through investing in real estate or are simply looking for a home mortgage, Joe is the guy to see. With more than 30 years in the financial/banking/mortgage/commercial lending industry and a strong team at his side, Joe has steadily increased his business success, while offering unique financing for his clients. When dealing with Joe Cuellar and his Team, one discovers an atmosphere of enthusiasm, a spirit of dedication, and a great desire to build quality relationships. 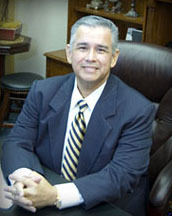 Joe grew up in the Rio Grande Valley and attended the University of Texas Pan American. He entered the finance world in 1980 and hasn’t looked back since. Friends and peers alike know Joe as the “Big Guy” with an even bigger heart. He will always go well beyond of what is expected of him, especially for those who ask for his help. This caring attitude in combination with his knowledge and experience has earned Joe extreme goodwill not only in the Valley, but also throughout the entire country. Since the start, Joe has achieved much success in the Mortgage field. He attributes his success in large part to hard work and in being a trusted advisor to his clients, thus earning their referrals and repeat business. Also, Joe is big on trust, and says that it is the essential ingredient in his success. “Without earning trust, a personal or professional relationship cannot last” says Joe. He goes on to say that as a business owner you’re only as good as your team and that hiring the right person for the job will ensure the future success and stability of your firm. Indeed, Joe readily admits that his vision would not be attainable without the backing of his experienced team! Success has followed Joe throughout his career and his achievement as a Mortgage Professional is no surprise to the many people who know him. Going the extra mile is standard for him; he has made reliability his promise, and integrity his trademark. His commitment to putting his client’s interest at the forefront of every transaction has earned him a loyal base of customer support as well as a strong foundation of referral business within the real estate and financial services community. Joe is committed to his family and is also a very active member of his church. He is also involved with many community Groups, especially if it involves sharing his vast knowledge with first time homebuyers or individuals who want to invest in Real Estate, construct a home or refinance their current home. Joe loves to give back to his community by giving free seminars to potential homebuyers groups, may it be a group of students, church groups, or any group wanting Mortgage knowledge.